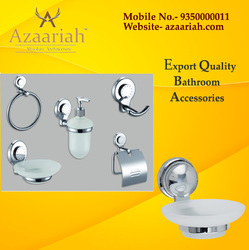 Legacy brand Azaariah, we are the manufacturer and exporter more than 10 years. We deliver export quality bathroom accessories for worldwide Market Standards. We have now curved a ninche in the stainless steel bathroom market. We deliver best stainless steel products like soap Dish Ring, Paper Holder, Tumbler Holder, Rob Hook Single, Rob Hook Double, Soap Dish +Tumbler, Soap Dish in different shapes, Soap Dish Ring, Towel Rack, Towel Rail, Tumbler Holder of different series such as Ice Series, Palmira Series, Shelves Series, Vitalia Series, Zebra Series. You can also find unique design for railings, that is suitable for your home and offices.